Anton Koberger printed the ninth German Bible in 1493. Koberger was originally a goldsmith, godfather of Albrecht Durer and produced approximately 250 works between 1471-1504, including arguably his most famous work, the Nuremberg Chronicle. He produced three versions of this bible (which reused 109 woodcuts from Quentell Cologne Bible of 1478-79) one uncolored, one hand colored with a typical Northern Germanic red, yellow and green colors, and a deluxe version that had gilding on the creation scene. Example of a crude paper repair, consisting of three layers that was causing the leaf to detach. This book had been on more or less constant display for almost 35 years, with only occasional page turns within the past 10 years. The case it was displayed in wasn’t properly sealed, the pages were very dirty and surprisingly brittle for 15th C. paper. There were roughly 243 tears, the first three signatures were beginning to detach, previous page repairs were visually distracting and causing physical damage, a previous reback was beginning to fail and the boxing was inadequate. First this massive volume was surface cleaned and the numerous small tears repaired. Earlier repairs that were causing damage were removed. 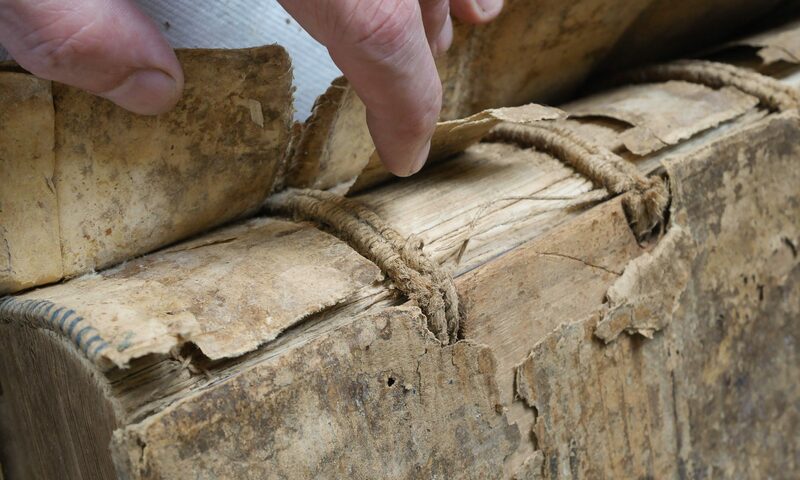 A common structural problem in 15-16th C. wood board binding structures is that the first few signatures tend to hinge with the board and separate from the textblock, straining the sewing structure and and in this case caused the thread to break. Detaching pages, previous reback and “repaired” flyleaf. Once the pages were repaired, the sewing thread was sound enough to mechanically reinforce, and the large size of the book made it possible to locally reinforce the first 3 signatures. After treatment with the first three signatures reinforced and placed into proper position. After treatment, the creation page with the leaf hinging properly and previous repairs removed. Although the previous reback was somewhat crude and the leather deteriorating, after consulting with colleagues it was decided to leave it alone, since the spine had reached a sort of stasis with the current spine lining and state of adhesives. The heavily overoiled original leather was also extremely fragile. Sometimes, a more drastic intervention can radically alter the delicate balance of stress pattern relationships between sewing thread, sewing supports, spine fold strength, adhesives, spine linings and covering materials that have evolved over the centuries. This sudden change can cause new, severe damage to previously undamaged structural aspects. The bottom of the box, made from canapetta circa. 2002. Given the massive size and weight of this book, and since the weight was concentrated on five small bosses had worn almost completely through, which is surprising, because canapetta is one of the stronger cloths. The weight of the book was also causing the lower board to begin cracking. To counteract this stress, support the board on the wood, rather than the bosses, and to aid in removal of the book from the box, I constructed a sliding shelf. Sliding shelf to support the lower board. Sliding shelf in action. Of course, this book is stored flat. The numerous layers provide firm support directly on the wood areas of the book, reducing the stress to the bosses. The handle on the left can be pulled, so that the book (about 20 pounds) can be lifted with both hands out of the clamshell, eliminating abrasion to the bosses. The outer tray was lined with ethafoam, to give firm, even support and reduce the likelihood of the book slipping during transport. It was a real joy to work on this book, and have some time to closely examine it’s structure and decoration. Below is a detail of Eve being created from Adam’s rib. Adam seems rather blase about it, or perhaps a little sad. CREDIT: UNION THEOLOGICAL SEMINARY, NYC. The clamshell and the tray look fantastic. I am in the project of making one similar case for a 1520 bible and I was trying to figure out the best containing form possible for both protecting and displaying this Bible. Do you think that the lid of the box can have a glass? is that recommended? I’d need more information about what you are trying to offer an opinion. I do know, however, that it it often quite difficult and time consuming to devise a housing system that combines safe long term storage and the aesthetic requirements for display. Wow, this is fascinating. Although technology seems to be replacing most printed materials, I hope the day never dawns that society loses appreciation for real books.